Nifty opened up around 6270 level but saw small profit booking towards the lows at 6240, but weekend short covering rally saw the index move towards 6280 but closed just below at 6276.95, a gain of 38.15 points. On a week on week basis the index gained 121.50 points of approx 1.97%. The broader market was just positive, with 734 advances to 719 declines. Developing range for the Series is around 6000-6400. Call option 6300-6800 added 32.45 lacs huge amount of OI with small short covering seen at 6200 and lower strike prices. 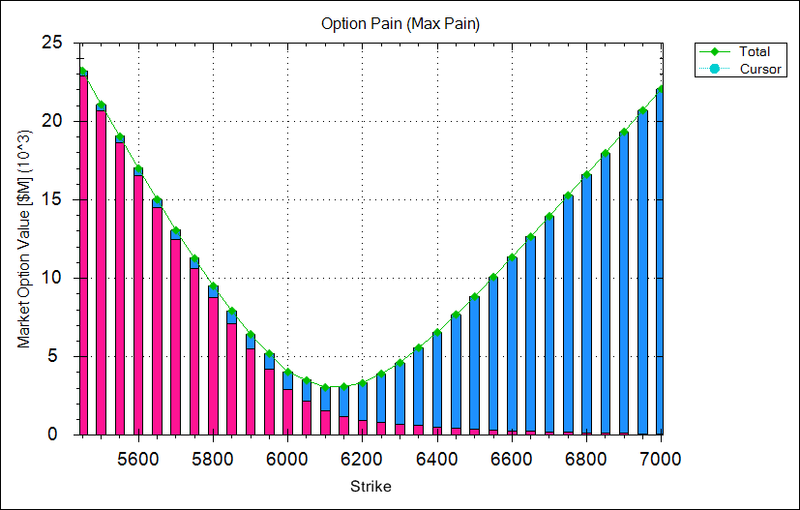 Put option 6300-5700 added 30.68 lacs huge amount of OI with not much change in other strike prices. 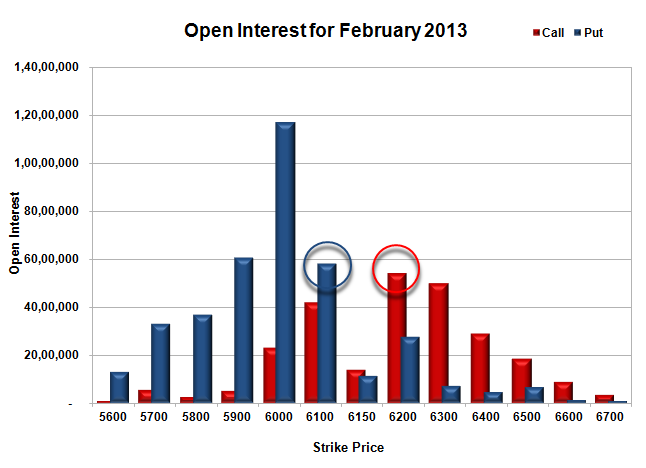 Nifty Open Interest is at 1,37,05,450 up by 98,300, with increase in price, most probably small long build-up. 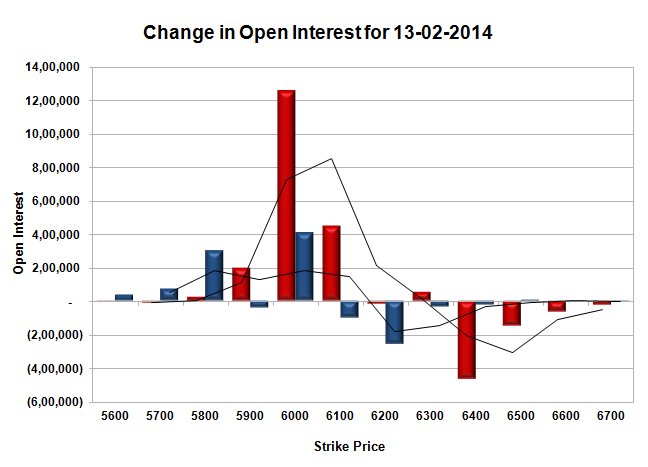 Bank Nifty Open Interest is at 15,46,650 up by 65,300, with increase in price, most probably huge long build-up. FII’s sold huge 2.07 lacs Futures, mostly short build-up, as their net OI increased by 56 contracts (includes 75514 longs and 79654 shorts for the day) and the average price per contract comes to around 6168.84. FII’s future open contract as on date is 293714. 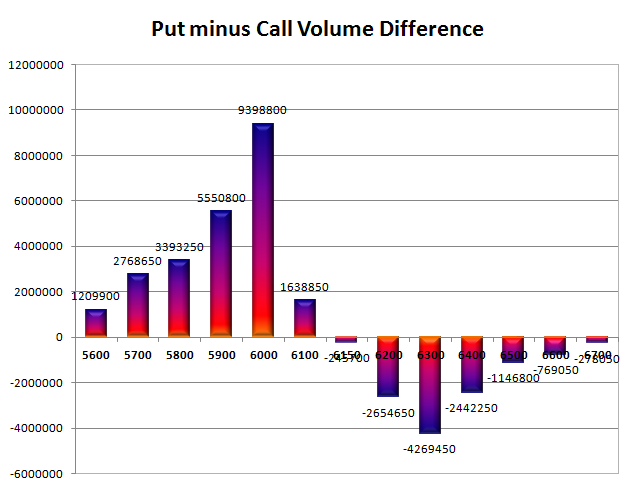 PCR Open Interest (Volume) has decrease a bit to 1.098. 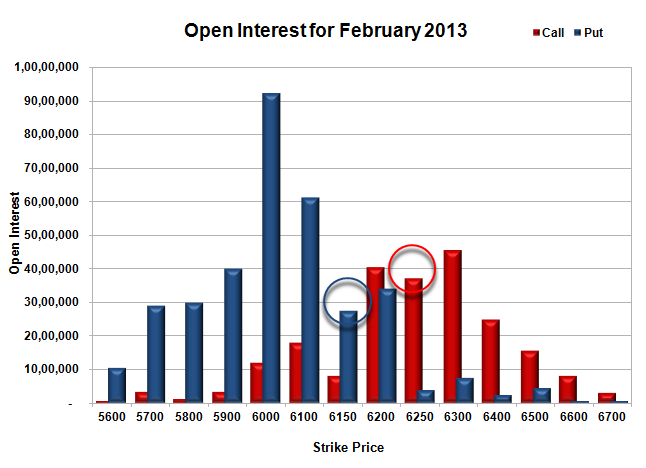 Initial support at 6200, with huge OI of 44.57 lacs and below that at 6100 with highest OI of 45.30 lacs. Initial and best resistance still at 6300, with huge OI of 44.42 lacs and above that at 6400, with OI of 39.79 lacs. 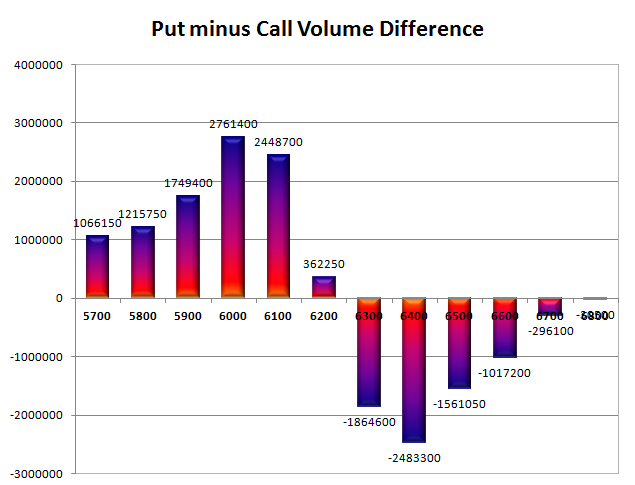 Day Range as per Option Table is 6220 - 6308 and as per VIX is 6230 - 6324 with 6263 as the Pivot. Nifty opened flat just above 6200 and went up with each passing hour to end February month expiry at the highest point of the month at 6238.80, a gain of 38.75 points. The broader market though was negative, with 693 advances to 749 declines. Developing range for the Series is around 6000-6400. 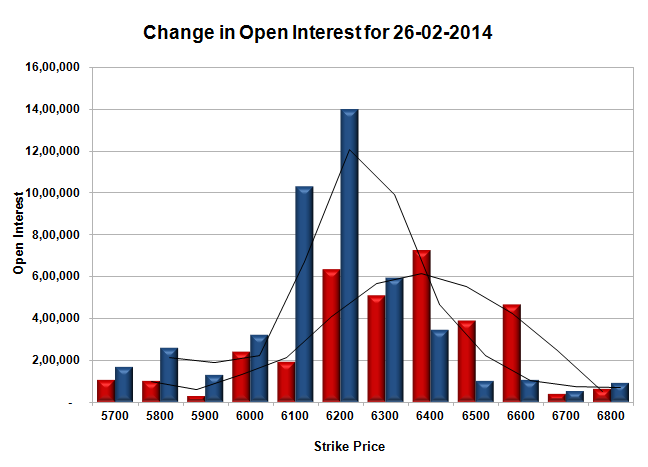 Call option 5700-6600 added 33.63 lacs huge amount of OI with not much change in other strike prices. 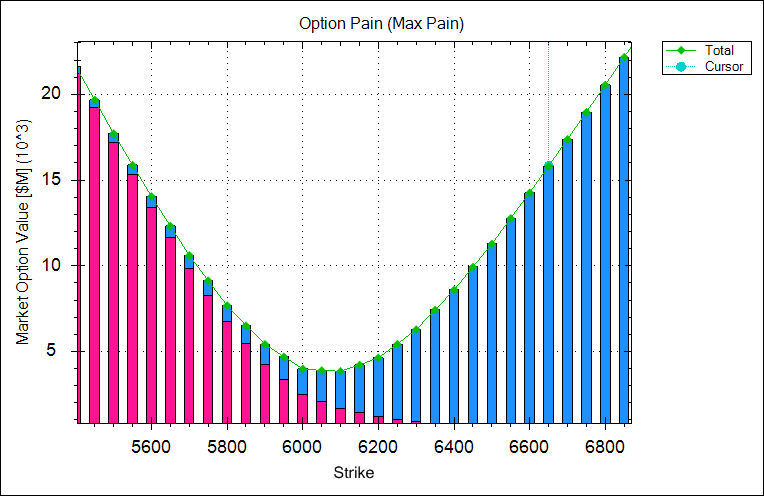 Put option 6600-5700 added 44.28 lacs huge amount of OI with not much change in other strike prices. 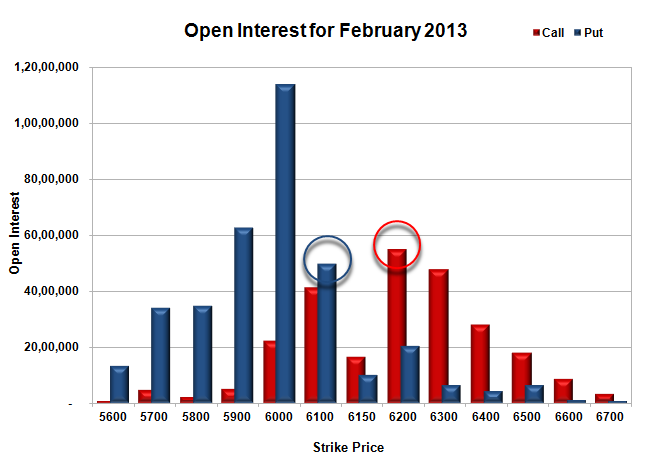 Nifty Open Interest is at 1,36,07,150 up by 44,84,150, with increase in price, most probably huge long build-up. Bank Nifty Open Interest is at 14,81,350 up by 4,09,950, with increase in price, most probably huge long build-up. FII’s bought huge 22.05 lacs Futures, mostly short covering, as their net OI decreased by 184579 contracts (includes 126678 longs and 82570 shorts for the day) and the average price per contract comes to around 6155.83. FII’s future open contract as on date is 293658. PCR Open Interest (Volume) at start of series is at 1.127. 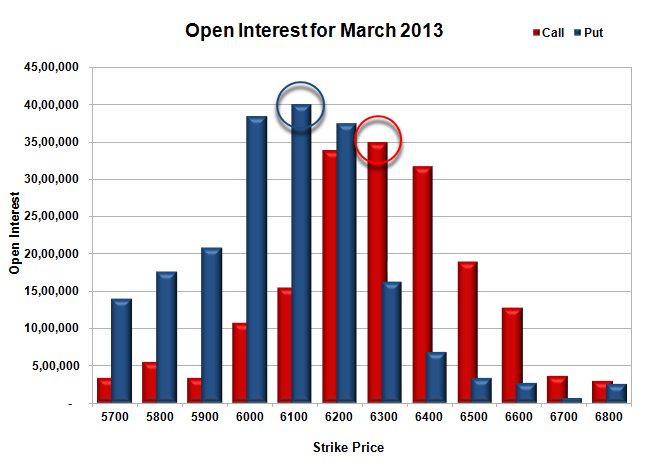 Initial support at 6200, with huge OI of 37.49 lacs and below that at 6100 with highest OI of 40.00 lacs. Initial and best resistance at 6300, with huge OI of 34.94 lacs and above that at 6400, with OI of 31.76 lacs. Day Range as per Option Table is 6184 - 6273 and as per VIX is 6193 - 6284 with 6229 as the Pivot. Nifty opened positive above the psychological level of 6200 but drifted down with each passing hour to lows of the day at 6176, but a small pullback during the afternoon session saw the index close above 6200 for the first time this month at 6200.05, a small gain of 13.95 points. The broader market though was negative, with 668 advances to 753 declines. Initial Support is developing at 6000 level for the next series. Call option 6250 added 15.27 lacs huge amount of OI with huge short covering seen at 6200 and below strike prices. Put option 6300-6150 added 13.00 lacs huge amount of OI with profit booking seen at 6100 and below strike prices. Nifty Open Interest is at 97,77,800 down by 26,00,850, whereas March series added 32.90 lacs with increase in price, most probably 100% rollover with huge long build-up. Bank Nifty Open Interest is at 12,64,350 down by 1,20,300, whereas March series added 2.31 lacs with increase in price, most probably 100% rollover with huge long build-up. FII’s bought huge 16.65 lacs Futures, mostly long build-up, as their net OI increased by 37423 contracts (includes 151991 longs and 118684 shorts for the day) and the average price per contract comes to around 6090.79. FII’s future open contract as on date is 478237. PCR Open Interest (Volume) made a new high at 1.696. Initial support at 6150, with huge addition for the day at 5.08 lacs and below that at 6100 with huge OI of 61.14 lacs. Initial resistance at 6250, with huge addition for the day at 15.27 lacs and above that at 6300, with OI of 45.39 lacs. 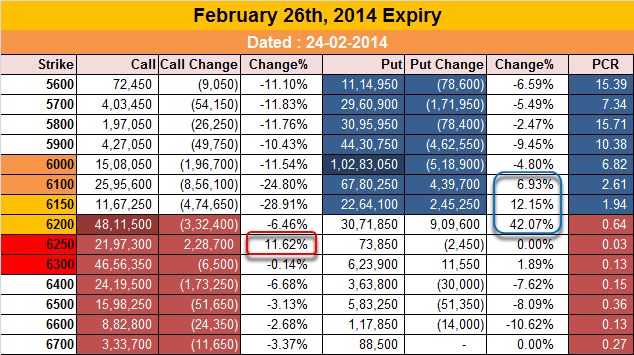 Expiry Day Range as per Option Table is 6153 - 6243 and as per VIX is 6155 - 6245 with 6198 as the Pivot. Nifty opened weak below 6150 level but saw the buyers taking control from the morning itself to move the index up with each passing hour. Nifty ultimately closed near the highs of the day at 6186.10, a huge gain of 30.65 points. The broader market was just positive, with 733 advances to 698 declines. Super support for the Series is at 6000PE with OI at 1.03 crore. Call option 6250 added 2.29 lacs huge amount of OI with huge short covering seen at 6150 and below strike prices. Put option 6200-6100 added 15.95 lacs huge amount of OI with profit booking seen at 6000 and below strike prices. Nifty Open Interest is at 1,23,78,650 down by 15,94,100, whereas March series added 20.73 lacs with increase in price, most probably 100% rollover with huge long build-up. Bank Nifty Open Interest is at 13,84,650 down by 85,825, whereas March series added 3.69 lacs with increase in price, most probably 100% rollover with huge long build-up. FII’s bought huge 9.57 lacs Futures, mostly long build-up, as their net OI increased by 29743 contracts (includes 118143 longs and 99004 shorts for the day) and the average price per contract comes to around 6074.93. FII’s future open contract as on date is 440814. 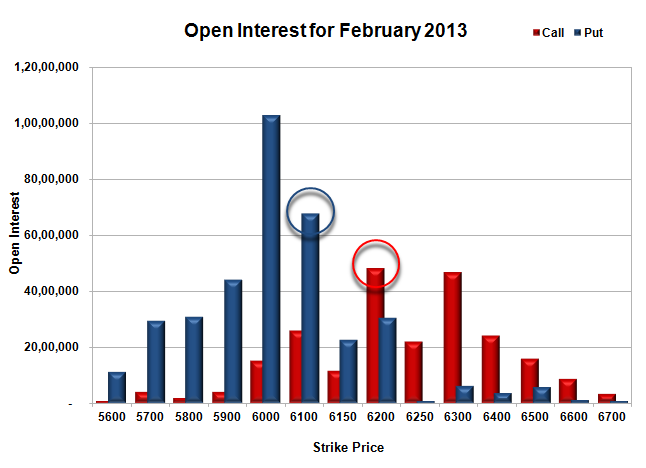 PCR Open Interest (Volume) is at the highest point of the series at 1.683. 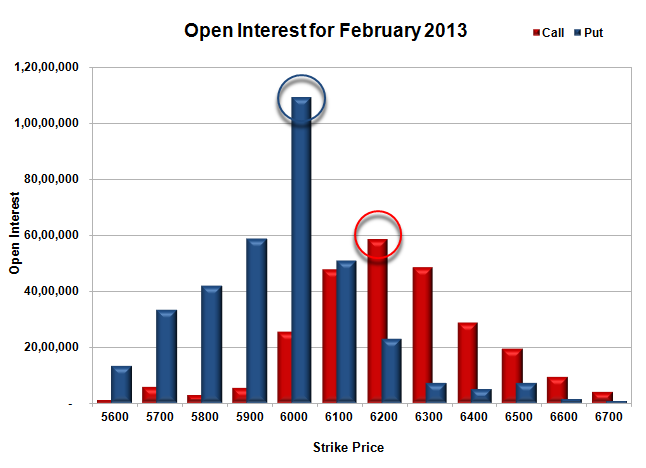 Initial support at 6100, with huge OI of 67.80 lacs and below that at 6000 with highest OI of 1.03 Crore. 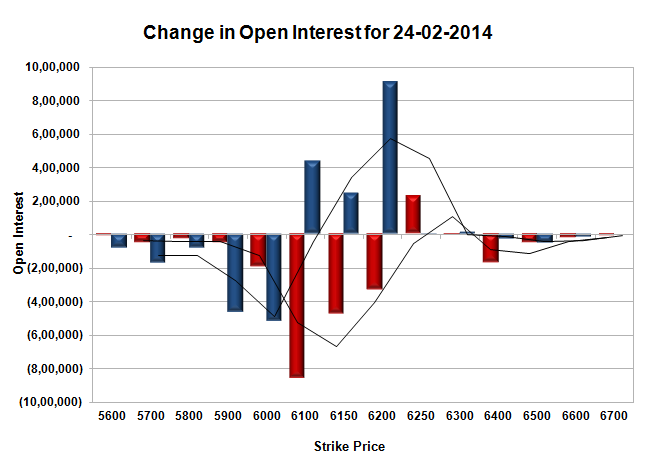 Initial and best resistance still at 6200, with huge OI of 48.12 lacs and above that at 6300, with OI of 46.56 lacs. Day Range as per Option Table is 6128 - 6219 and as per VIX is 6140 - 6233 with 6170 as the Pivot. Nifty opened positive above 6100 and immediately got the support of the buyers to move higher around 6145. A range bound consolidation ended with short covering, which saw the Index close around the highs at 6155.45, a huge gain of 64.00 points. On a week on week basis the index gained 107.10 points or about 1.77%. The broader market was also strong, with 847 advances to 554 declines. Super support for the Series is at 6000PE with OI at 1.08 crore. 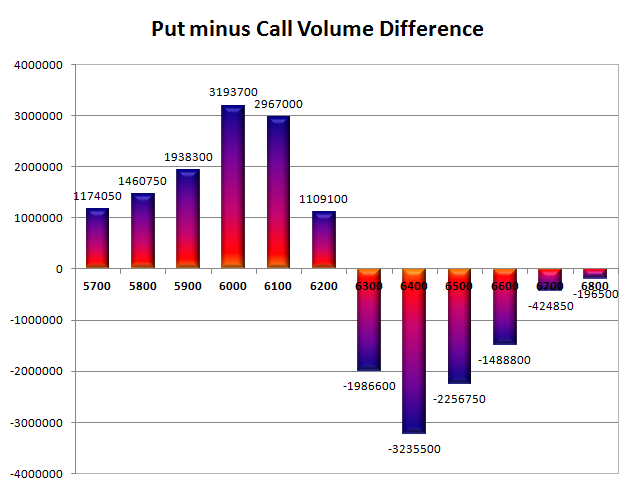 Call option did not add any OI whereas huge short covering was seen at 6100 and below strike prices. Put option 6200-6100 added 24.53 lacs huge amount of OI with profit booking seen at 6000 and below strike prices. Nifty Open Interest is at 1,39,72,750 down by 9,01,300, whereas March series added 8.82 lacs with increase in price, most probably rollover with small short covering. Bank Nifty Open Interest is at 14,70,475 down by 1,18,075, whereas March series added 2.46 lacs with increase in price, most probably 100% rollover with huge long build-up. FII’s bought huge 3.64 lacs Futures, mostly long build-up, as their net OI increased by 15249 contracts (includes 64693 longs and 57412 shorts for the day) and the average price per contract comes to around 6043.22. FII’s future open contract as on date is 411071. 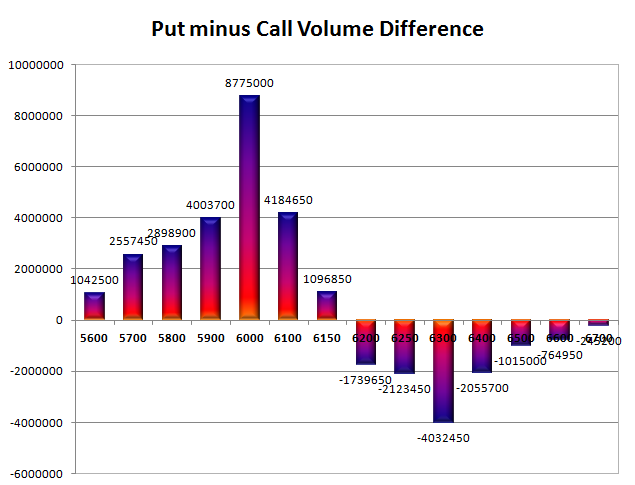 PCR Open Interest (Volume) is at the highest point of the series at 1.574. 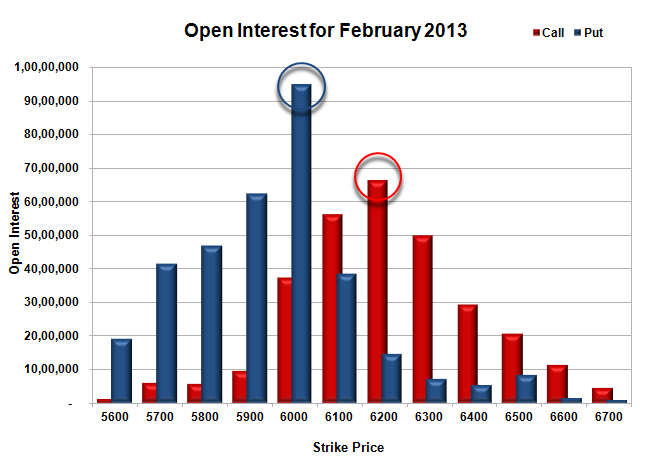 Initial support at 6100, with huge OI of 63.40 lacs and below that at 6000 with highest OI of 1.08 Crore. 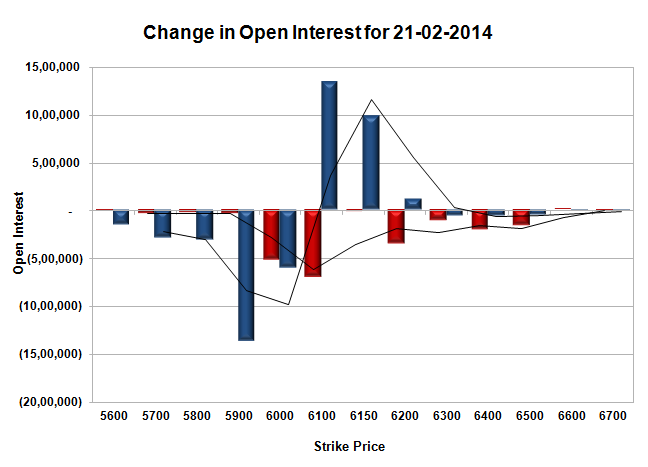 Initial and best resistance at 6200, with huge OI of 51.44 lacs and above that at 6300, with OI of 46.63 lacs. Day Range as per Option Table is 6100 - 6189 and as per VIX is 6110 - 6201 with 6141 as the Pivot. Nifty opened weak and stayed weak throughout the entire session of trade to close around the low point below the psychological level of 6100 at 6091.45, a huge loss of 61.30 points. The broader market was also weak, with 558 advances to 851 declines. Super support for the Series is still at 6000PE with OI now at 1.14 crore. 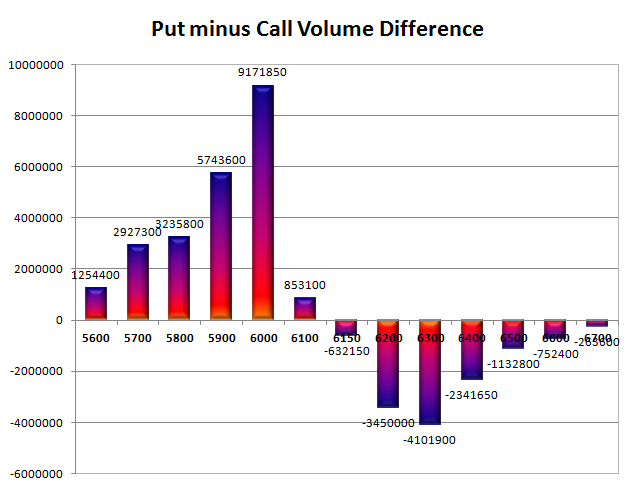 Call option 6150-6200 added 3.20 lacs huge amount of OI with profit booking seen at 6300 and above strike prices. 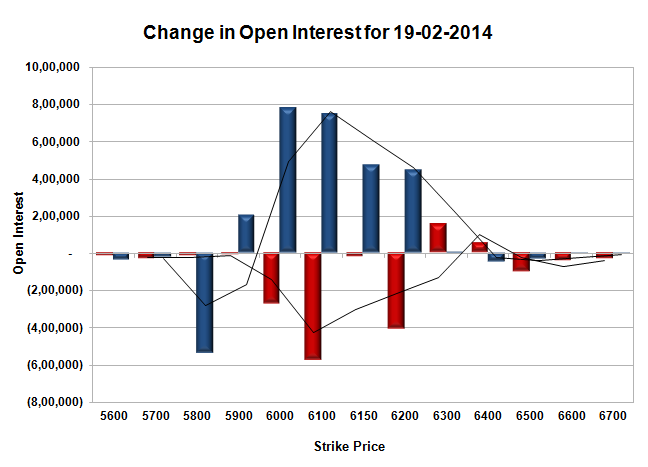 Put option 5700-5600 added 1.28 lacs of OI with huge short covering seen at 6100 and above strike prices. Nifty Open Interest is at 1,48,74,050 down by 8,17,600, whereas March series added 3.33 lacs with decrease in price, most probably huge long liquidation with some rollover. Bank Nifty Open Interest is at 15,88,550 down by 38,875, whereas March series added 0.62 lacs with decrease in price, most probably 100% rollover with some short build-up. FII’s sold huge 5.22 lacs Futures, mostly short build-up, as their net OI increased by 9122 contracts (includes 42288 longs and 52724 shorts for the day) and the average price per contract comes to around 6006.54. FII’s future open contract as on date is 395822. PCR Open Interest (Volume) went down a bit to 1.498 due to huge liquidation at 6100-6200PE. Initial support still at 6100, but looking very weak with huge liquidation of 8.35 lacs for the day and below that at 6000 with highest OI of 1.14 Crore. Initial resistance at 6150, with huge addition for the day at 2.50 lacs and above that at 6200, with OI of 54.93 lacs. Day Range as per Option Table is 6056 - 6147 and as per VIX is 6043 - 6140 with 6102 as the Pivot. Nifty opened flat and stayed within a narrow range of 10 points with positive bias for the better part of the day, a huge short covering towards the end of the day saw the index close near the high point at 6152.75, gain of 25.65 points. The broader market was also positive, with 777 advances to 652 declines. Super support for the Series is at 6000PE with OI now at 1.17 crore. Call option 6300-6400 added 2.08 lacs huge amount of OI with huge short covering was seen at 6100 and lower strike prices. Put option 6200-5900 added 26.51 lacs huge amount of OI with profit booking seen at 5800 and lower strike prices. Nifty Open Interest is at 1,56,91,650 up by 8,450, whereas March series added 3.29 lacs with increase in price, most probably huge long build-up. Bank Nifty Open Interest is at 16,27,425 down by 55,725, whereas March series added 0.35 lacs with increase in price, most probably long liquidation with some rollover. FII’s bought 2.90 lacs Futures, mostly short covering, as their net OI decreased by 2674 contracts (includes 36219 longs and 30423 shorts for the day) and the average price per contract comes to around 6064.58. FII’s future open contract as on date is 386700. PCR Open Interest (Volume) has jumped to 1.530. Initial support getting better at 6100, with huge OI of 58.34 lacs and below that at 6000 with highest OI of 1.17 Crore. Initial and best resistance still at 6200 though getting weaker, with OI of 54.24 lacs and above that at 6300, with OI of 50.00 lacs. Day Range as per Option Table is 6102 - 6192 and as per VIX is 6104 - 6201 with 6146 as the Pivot. Nifty opened flat but saw the responsive buyers take control to move the index above 6100. Nifty closed above 6100 for the first time this month at 6127.10, gain of 53.80 points. The broader market was also strong, with 807 advances to 601 declines. Super support for the Series is at 6000PE with OI now above 1.09 crore. 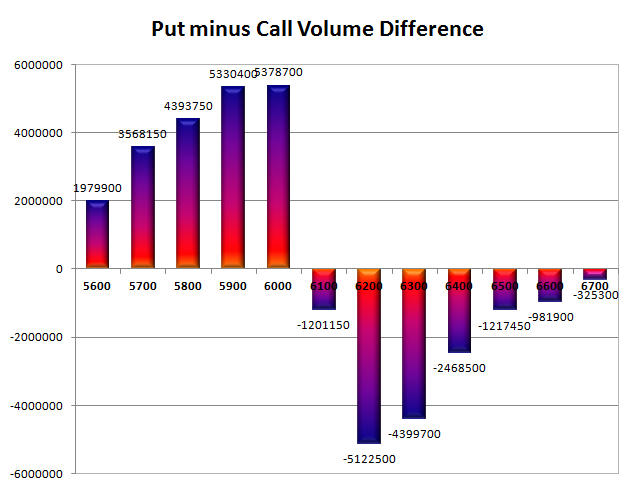 Call option did not see any addition whereas huge short covering was seen at 6000 and lower strike prices. Put option 6200-5900 added 29.20 lacs huge amount of OI with profit booking seen at 5800 and lower strike prices. Nifty Open Interest is at 1,56,83,200 down by 5,70,550, whereas March series added 3.26 lacs with increase in price, most probably rollover with some short covering. Bank Nifty Open Interest is at 16,83,150 up by 21,050, whereas March series added 0.36 lacs with increase in price, most probably huge long build-up. FII’s bought huge 10.36 lacs Futures, mostly long build-up, as their net OI increased by 323 contracts (includes 71544 longs and 50833 shorts for the day) and the average price per contract comes to around 6042.48. FII’s future open contract as on date is 389374. PCR Open Interest (Volume) has moved to the high point of the series at 1.418. 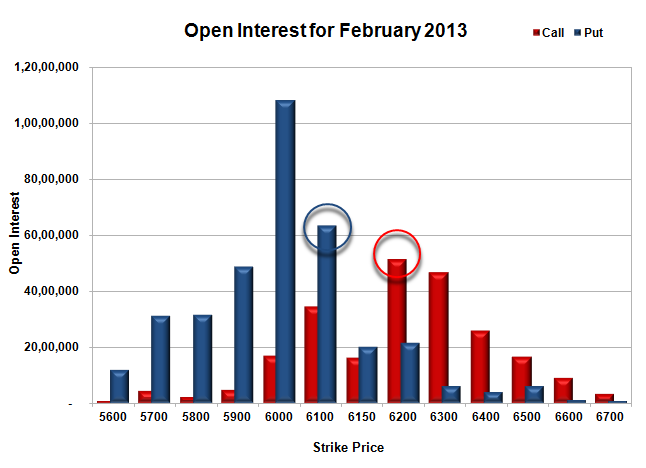 Initial support now at 6100, with huge OI of 50.88 lacs and below that at 6000 with highest OI of 1.09 Crore. 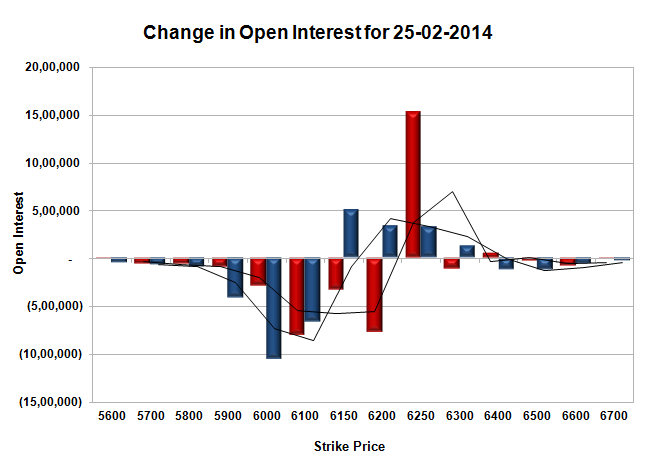 Initial and best resistance at 6200, with OI of 58.32 lacs and above that at 6300, with OI of 48.47 lacs. Day Range as per Option Table is 6070 - 6165 and as per VIX is 6078 - 6177 with 6112 as the Pivot. Nifty opened positive and went on to touch 6079 within the first few minutes of trade, but saw a dip towards 6040 as the Interim Budget was on. The index saw the buyers back in action and closed positive at 6073.30, gain of 24.95 points. The broader market though was weak, with 582 advances to 824 declines. Super support for the Series is at 6000PE with OI now above 1 crore. 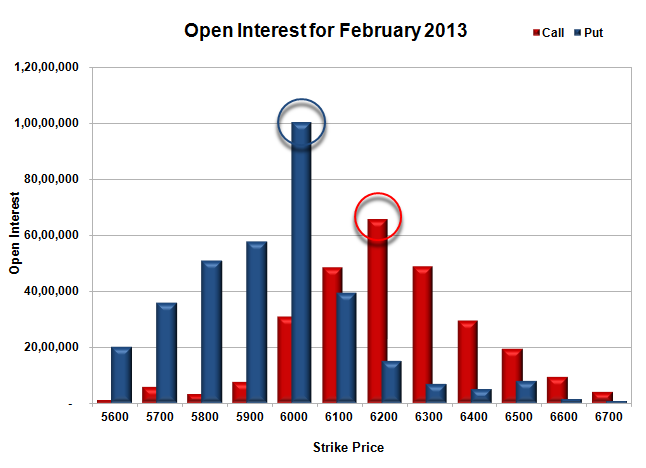 Call option 6100-6200 added 3.01 lacs huge amount of OI with short covering seen at 6000 and lower strike prices. Put option 6200-6000, 5800 added 22.62 lacs huge amount of OI with profit booking seen at 5700 and lower strike prices. 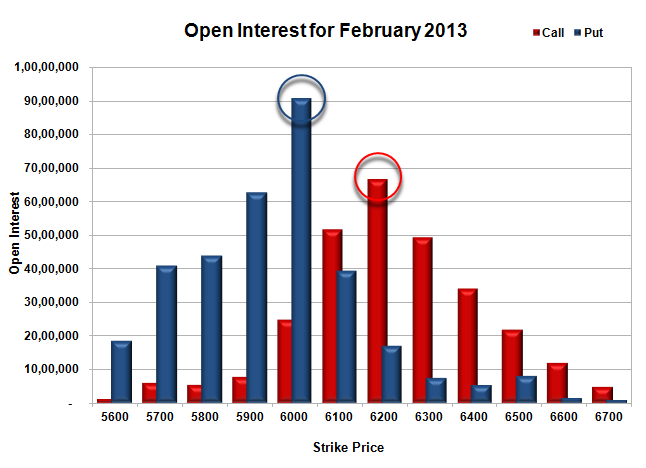 Nifty Open Interest is at 1,62,53,750 up by 48,550, with increase in price, most probably long build-up. 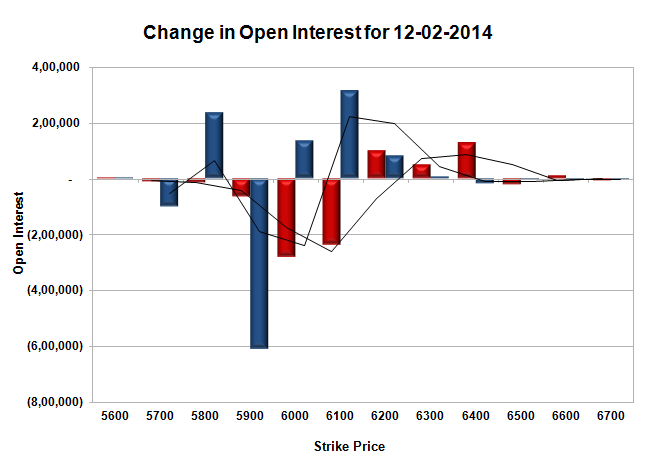 Bank Nifty Open Interest is at 16,62,100 down by 42,300, with increase in price, most probably huge short covering. FII’s bought 3.93 lacs Futures, mostly long build-up, as their net OI increased by 2879 contracts (includes 38790 longs and 30931 shorts for the day) and the average price per contract comes to around 6004.76. FII’s future open contract as on date is 389051. PCR Open Interest (Volume) is moving up and now at 1.289. Super Best support at 6000, with highest OI of 1.00 Crore and below that at 5900 with huge OI of 57.80 lacs. 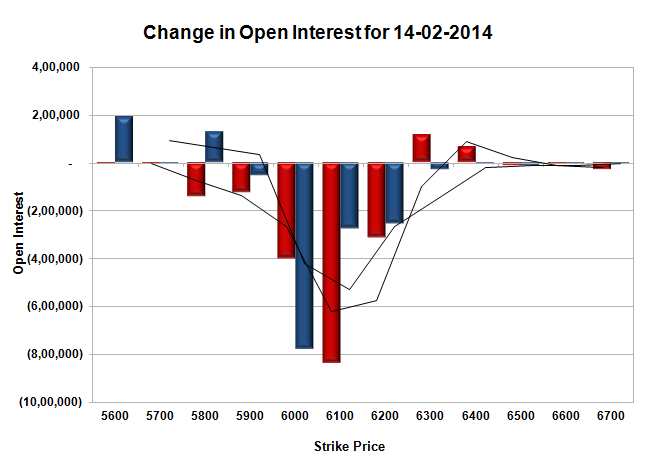 Initial resistance still at 6100, with OI of just 48.50 lacs and above that at 6200, with huge OI of 65.61 lacs. 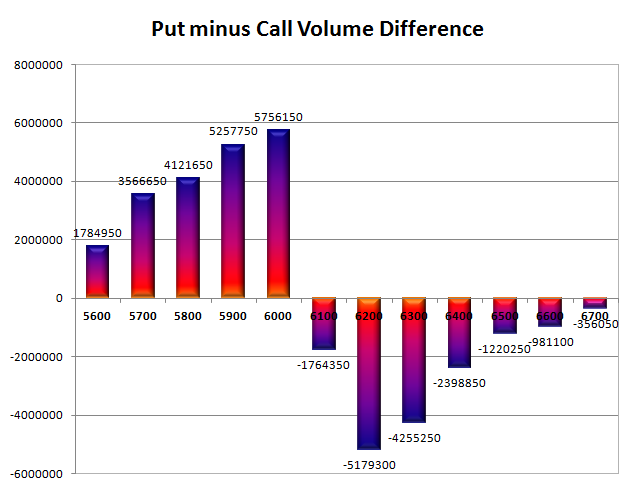 Day Range as per Option Table is 6021 - 6113 and as per VIX is 6023 - 6124 with 6064 as the Pivot. Nifty opened flat to positive, but saw the Sellers taking control from the word go and had a perfect trend day closing at the lowest point at 6001.10, a huge loss of 82.90 points. The broader market was also very weak, with just 392 advances to 1031 declines. Best support for the Series still at 6000PE with OI now around 95 lacs. Call option 5900-6100 added 19.10 lacs huge amount of OI with profit booking seen at 6400 and above strike prices. 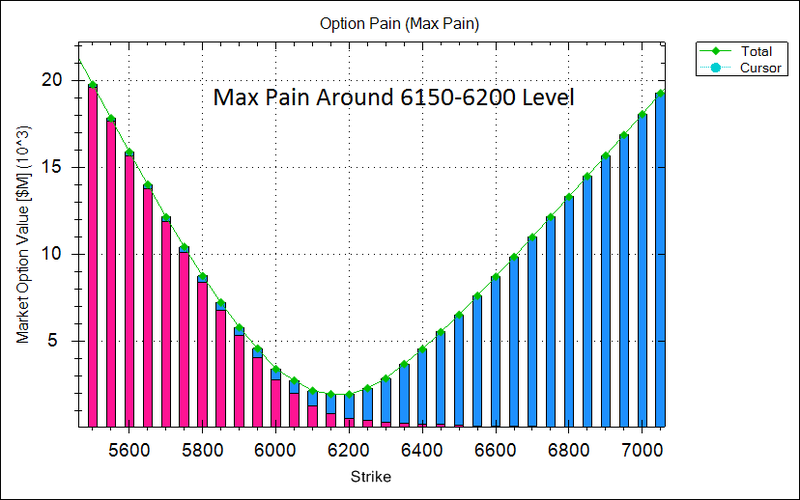 Put option 6000, 5800-5600 added 8.18 lacs huge amount of OI with short covering seen at 6100 and above strike prices. 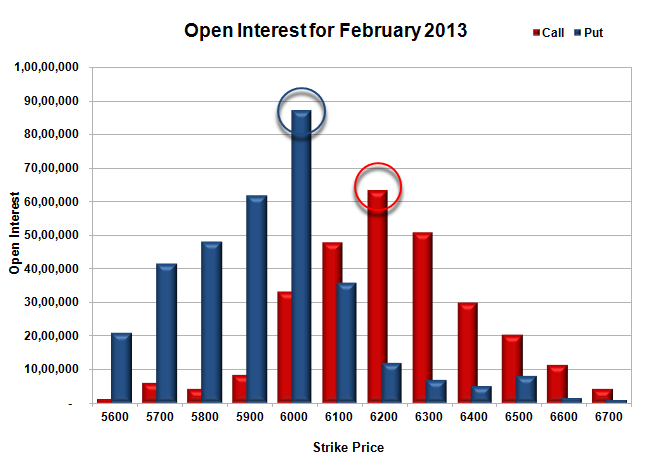 Nifty Open Interest is at 1,66,56,500 up by 11,30,150, with decrease in price, most probably huge short build-up. 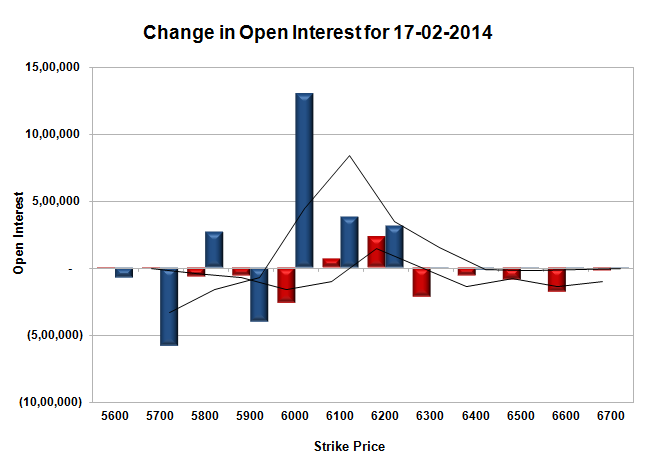 Bank Nifty Open Interest is at 17,44,150 up by 13,000, with decrease in price, most probably short build-up. FII’s sold huge 3.42 lacs Futures, mostly short build-up, as their net OI increased by 13752 contracts (includes 38526 longs and 45366 shorts for the day) and the average price per contract comes to around 5925.66. FII’s future open contract as on date is 385814. PCR Open Interest (Volume) has dropped to 1.202. 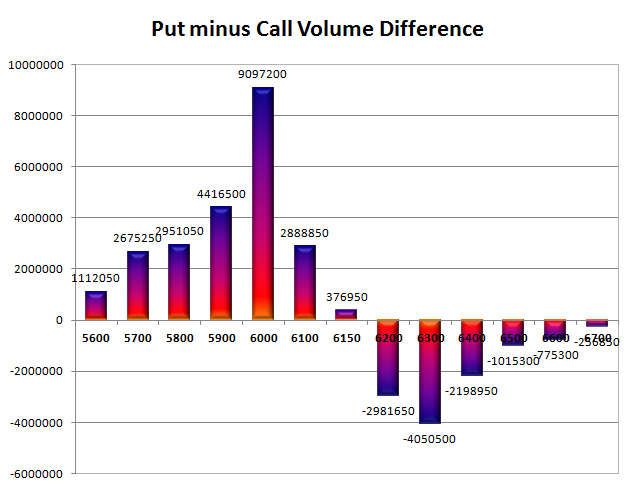 Best support still at 6000, with highest OI of 94.96 lacs and below that at 5900 with huge OI of 62.37 lacs. 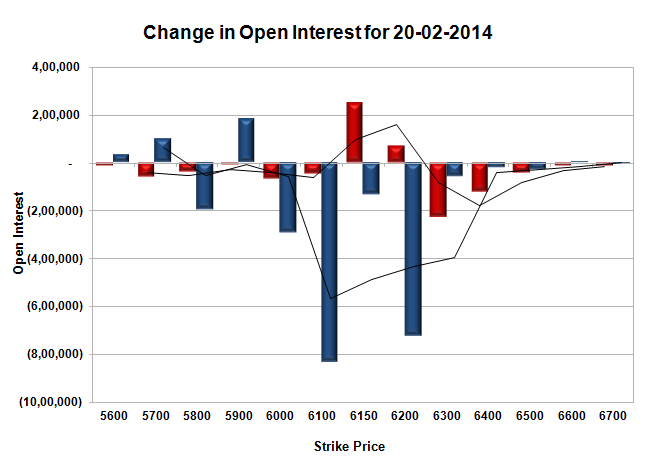 Initial resistance getting better at 6100, with huge OI of 56.22 lacs and above that at 6200, with OI of 66.41 lacs. 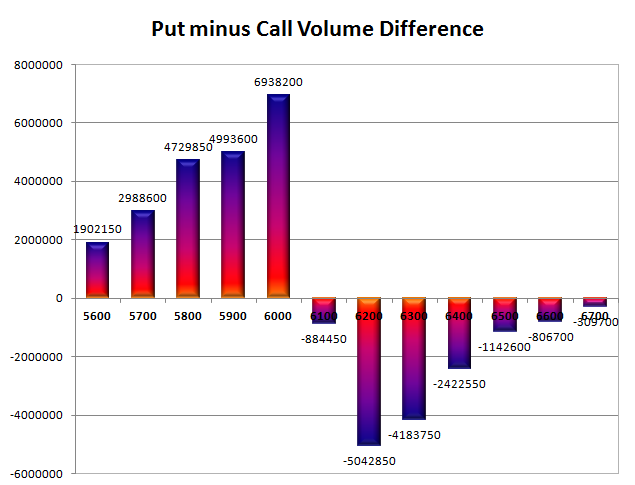 Day Range as per Option Table is 5975 - 6070 and as per VIX is 5945 - 6057 with 6029 as the Pivot. Nifty opened positive around 6085, and after a initial move towards the highs of the day at 6106, it drifted down with each passing hour to close around the same level where it opened and in the process had a ‘DOJI’ candle. The index for the day closed at 6084.00, gain of 21.30 points. The broader market though was weak, with 636 advances to 767 declines. Best support for the Series at 6000PE with OI now above 90 lacs. 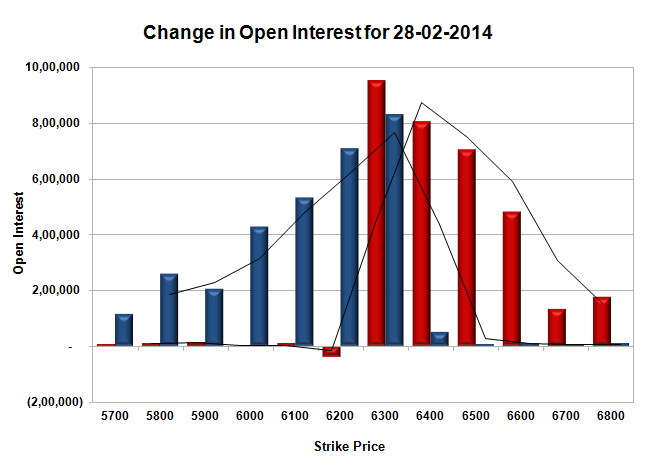 Call option 6200-6400 added 2.75 lacs huge amount of OI with short covering seen at 6100 and below strike prices. Put option 6000-6200 added 5.31 lacs huge amount of OI with profit booking seen at 5900 and below strike prices. 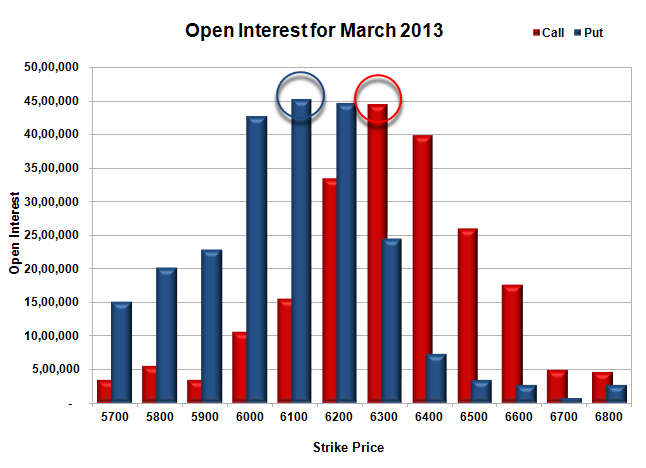 Nifty Open Interest is at 1,55,26,350 down by 3,87,900, with increase in price, most probably short covering. Bank Nifty Open Interest is at 17,31,150 down by 1,71,525, with increase in price, most probably huge short covering. FII’s bought huge 1.36 lacs Futures, mostly short covering, as their net OI decreased by 11645 contracts (includes 35734 longs and 33005 shorts for the day) and the average price per contract comes to around 6016.80. FII’s future open contract as on date is 372062. 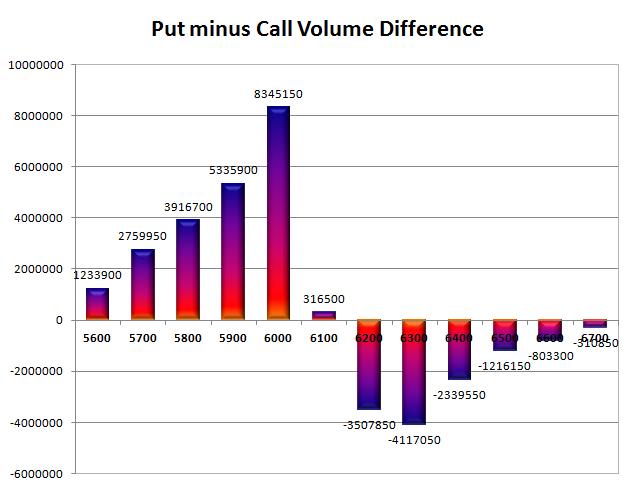 PCR Open Interest (Volume) has dropped a bit due to huge profit booking at 5900PE and now at 1.252. Best support at 6000, with highest OI of 90.88 lacs and below that at 5900 with huge OI of 62.77 lacs. 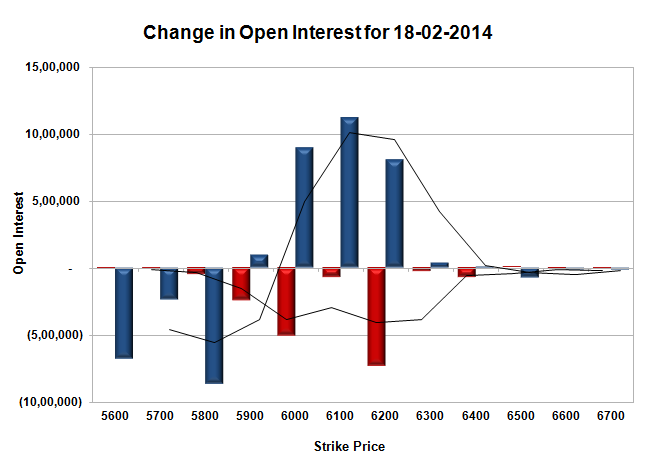 Initial resistance still at 6100, with huge OI of 51.70 lacs and above that at 6200, with OI of 66.55 lacs. 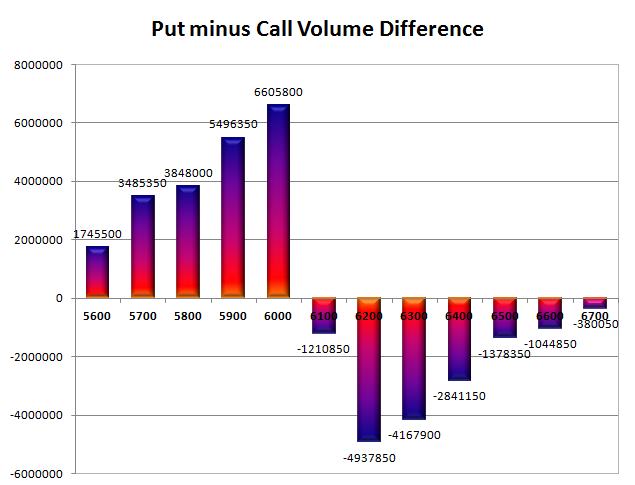 Day Range as per Option Table is 6042 - 6132 and as per VIX is 6028 - 6140 with 6089 as the Pivot.